What is your ‘food for the soul’? Is it meditation? Or shopping or talking to a close friend or maybe even listening to your favorite music? Well, for some ‘food’ is the 'food for the soul'. Eating good food enriches not only your body but also your mind and soul. Natural food made with natural ingredients is the best way to cook your food. As they say, your body is like a temple. So eating good food will make it live longer and your thoughts and mind would also be positive as a result. I really don’t like to cook so much; though I love food. Trying out different cuisines, cooked differently is one of my most favorite hobbies. After a lot of criticism from my near and dear ones, I have started trying to prepare a dish or two. I must say it is a good experience; cooking is a form of art, just like writing or dancing. Hence I am going to write about what I cooked today. 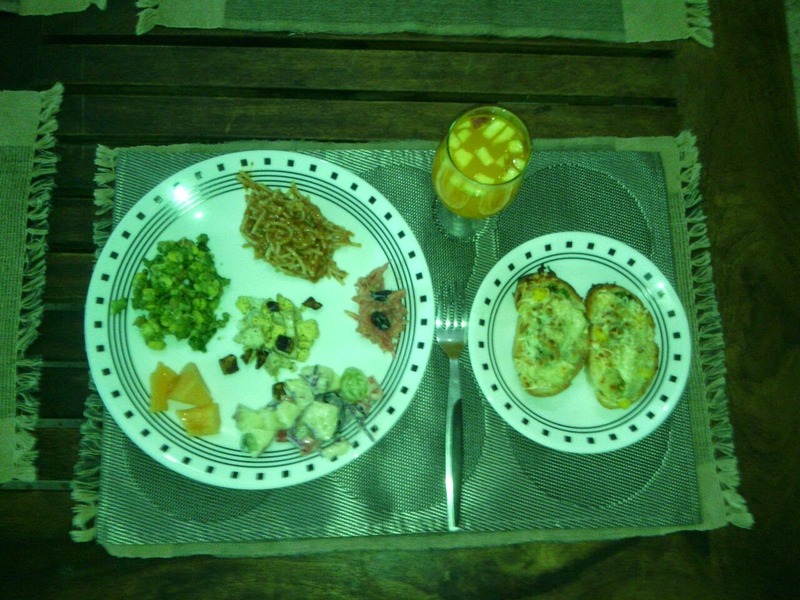 As I said I am not a fan of cooking, so I have started with simple, basic things. I like to cook at times, but I most certainly can’t do it every day. I am a graceful person, but I don’t know why I transform into this clumsy person as soon as I step into the kitchen. I hardly ever manage to prepare a dish successfully, but mostly manage to break a dish or a bowl. My mom gets very irritated due to this and I don’t blame her. 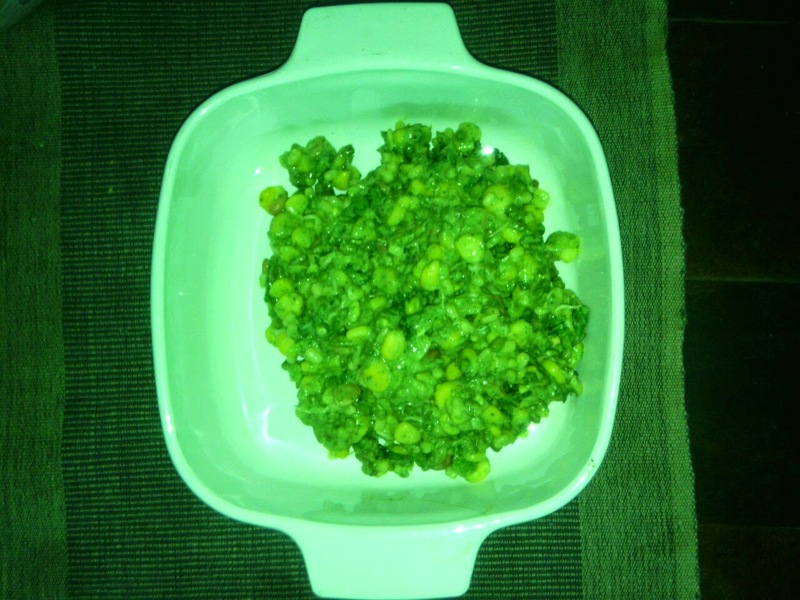 I prepared this with a green paste(made of coriander, mint and green chillies) and curd. I added boiled corn, sprouted beans, roasted and salted peanuts and green and red bell pepper to the paste. I squeezed a lemon on my salad and mixed it. I garnished with mint leaves after adding a little salt. This is an interesting mix of fruit and veggies. I made a paste of little mayonnaise and seasoning and threw in some chopped boiled potatoes and freshly sliced apples. 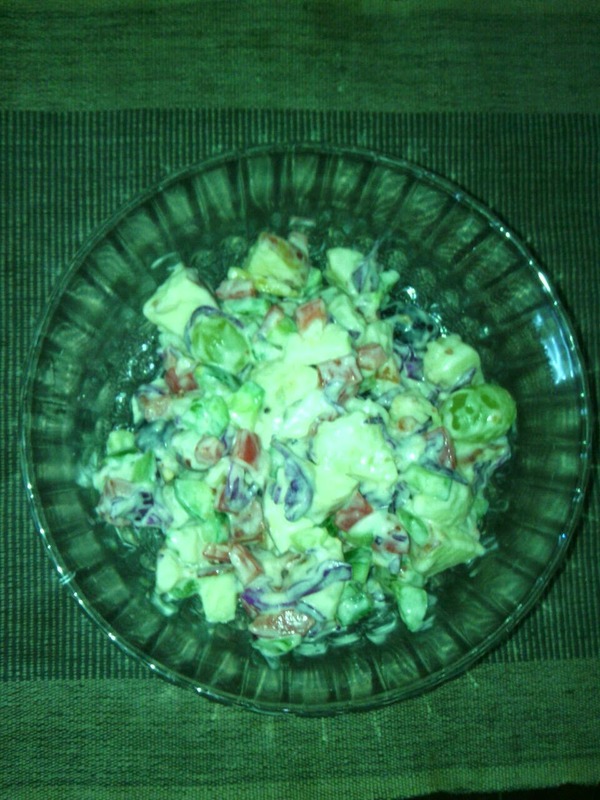 I also added red cabbage, cucumber, grapes and bell pepper. I sprinkled oregano and chilli flakes. Added salt to taste. 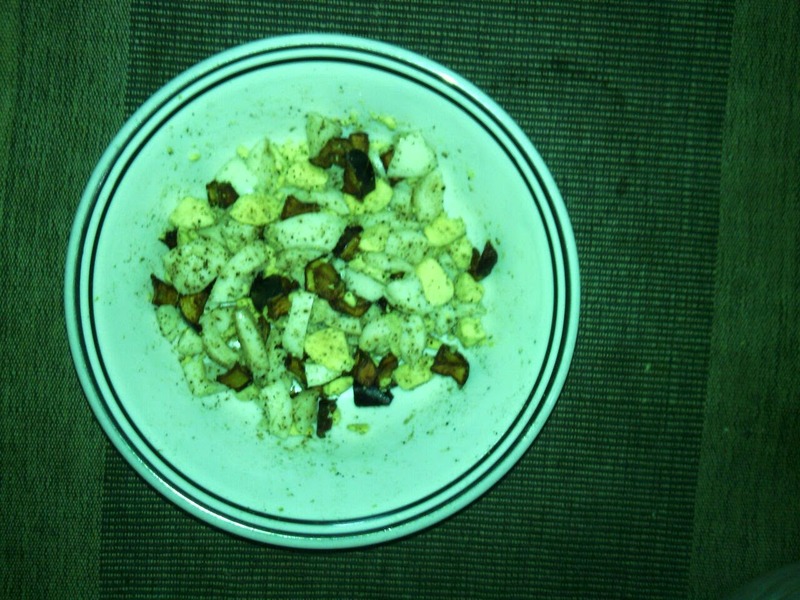 Yes, I really got the idea of mixing eggs and egg plant as they both have the word "egg" in them. I boiled three eggs and froze them and chopped one egg plant and deep fried it. I mixed the two and sprinkled little salt and pepper and voila, the salad was ready! I heated little milk and added sugar in it. I added grated carrot and the dried black grapes in it. Let the mixture cool and added a dash of mayo. 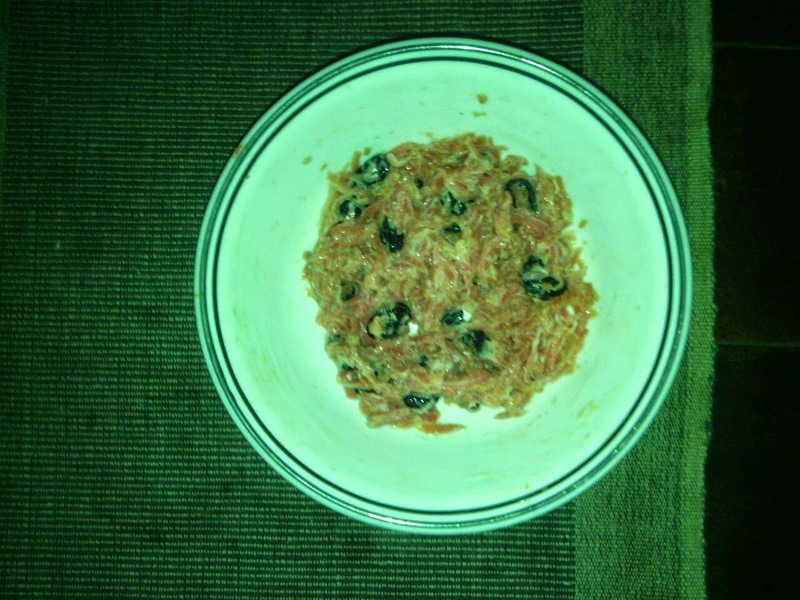 For this one I made tomato puree, also added onions to it. I dashed in some cinnamon powder and salt. 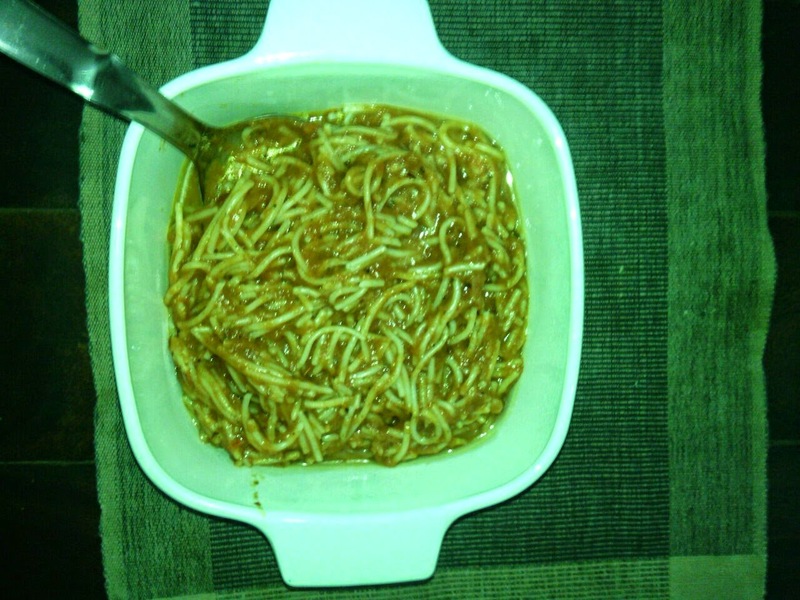 I added boiled spaghetti into the paste and added seasoning. I garnished with lots of oregano and chilli flakes. I put little butter on the bread. I also put very thinly sliced ginger, chopped garlic, green chillies, boiled American corn, green bell pepper and onion on it. 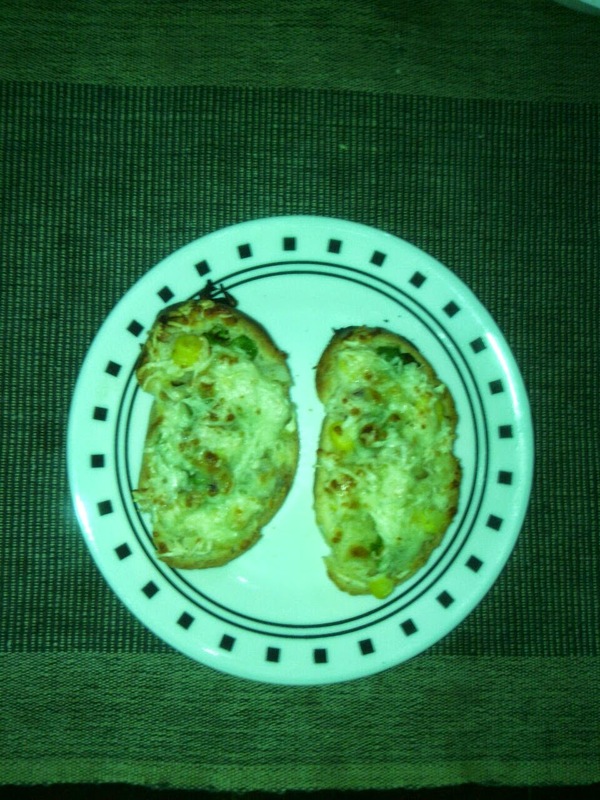 I sprinkled some grated Mozzarella and Amul Cheddar cheese and toasted the garlic bread in the oven. 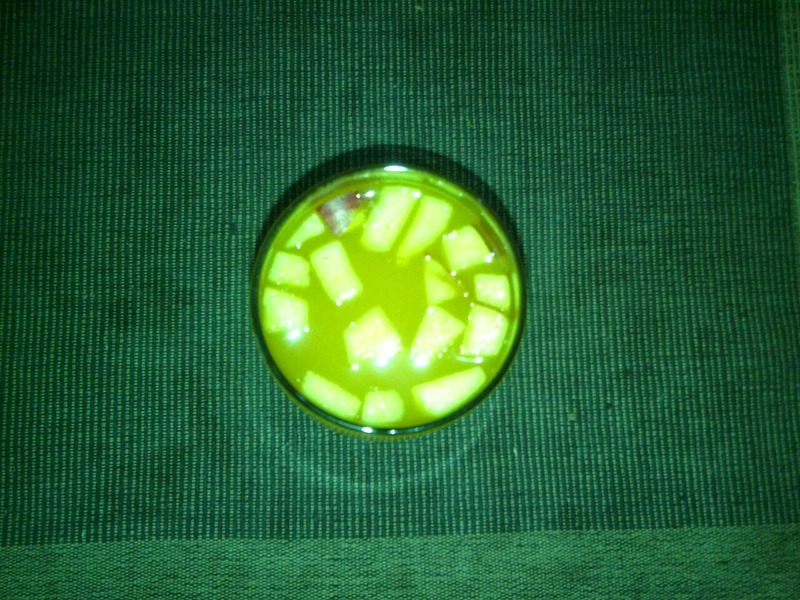 This is a preparation of mixing Rasna Mango, Orange and Lemon flavors and adding some sliced apples. I served it chilled. But I realized, when you prepare dishes for your loved ones, you feel happier when they enjoy it. Your satisfaction comes from the fact that they liked the food you prepared. At some point, you don't bother about how much you enjoyed your food. Hence I say, cooking is an art. It satisfies your soul even when you cook; not just while eating it. Kudos to all of those who cook with love and care for their family everyday. All the dishes have a secret ingredient that is the most unique, the ingredient which is made of the love the person feels while cooking. Welcome to the wonderful world of cooking my love!